Citroen 2CV key chain by RalfEdmund is licensed under the Creative Commons - Attribution license. I've created this keychain as a gift for a friend. This eye-catching var was her very first vehicle and is gone long ago. Up to now I had not chance to print this model, but Slic3r seems to be pleased with the STL-file. 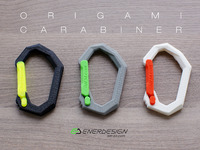 The design is intended to switch the color of the filament after printing up to a height of 3mm. 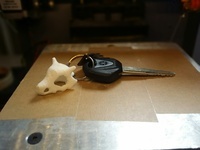 As soon as I'm back at my printer, I'll print the first layers with black PLA and use red PLA for the rest of the keychain. Update: I finally printed to with color changes after 2 and 3 mm. Came out OK. I think, I'll leave it that way. 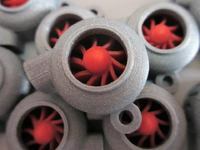 I'll print it on thursday using black and red PLA with a color change after 3mm. Say thanks by giving RalfEdmund a tip and help them continue to share amazing Things with the Thingiverse community. We're sure RalfEdmund would love a Tip, but unfortunately they have not setup their accounts to receive them yet.